Have you pre-ordered your new handheld yet? 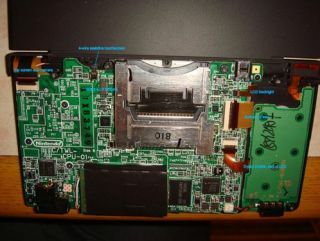 The gizzards of a Nintendo DSi - don't try this at home kids! UK retailers are advising that gamers without pre-orders for the new Nintendo DSi, which launches this coming Friday, are unlikely to get their hands on the new Zelda machine at launch. "The supply is tight, there's just not a great amount of stock out there," Don McCabe, managing director of UK retailer Chips, told GamesIndustry.biz. "Basically everything that we're getting in is already pre-sold before it hits the shop floor. It's a 100 per cent sell out for us... Our concern is when the next batch is in and we haven't had an announcement on that yet." "Pre-orders have been strong on DSi from day one, and with both ourselves and Nintendo ramping up press and PR activity this week, we expect to see them increase even more going into Friday," added Toby Burton, HMV's senior games buyer. "We are encouraging our customers to place a pre-order with us to avoid disappointment, as we cannot guarantee that we will have free stock available in all of our stores. We always do our best to satisfy customer demand, but this very much depends on the availability of DSi hardware from Nintendo." TechRadar has contacted Nintendo UK to find out more about DSi stock allocation at launch and over the coming months, so stay tuned for updates. And don't head out to grab a new handheld on Friday without that pre-order slip in your mitts!